Playtech has released another Sporting Legends series slot with iconic jockey AP McCoy the star – back a winner in this exhalating release which has plenty on the feature front. AP McCoy: Sporting Legends comes with 5 reels and 243 ways to win – playable on desktop, mobile and tablet devices from just 25p a spin, this horse racing themed title is rather simple design wise but does feature Tony talking as you spin those reels. It comes with a Bonus Wheel feature where you can win cash bonuses and get a boost when you enter the Free Games feature – there’s additional free spins, wild multiplier boosts and multiplier boosts as well as prizes up to 1,000 times your stake on offer. You can also enter the Winning Line Free Games feature where you begin with 10 free spins – any boosts won in the Bonus Wheel feature are applies meaning you can benefit from extra free spins, wild multipliers up to 7x and win multipliers up to 7x. If you get a winning free spin with more than 1 wild multiplier, the values are multiplied to give you a multiplier up to 49x. There’s a new Playtech Power Play feature where you get 5 free spins for 10 or 20 times your stake with wins added add and totaled. The Accumulator Plus option sees wilds collected on losing spins and then added onto the reels for 1 Super Spin. Lastly, there are 3 progressive jackpots to be won – you have the daily, weekly and Mega Jackpots. The latter is the most rewarding and is currently worth a whopping £620,000! 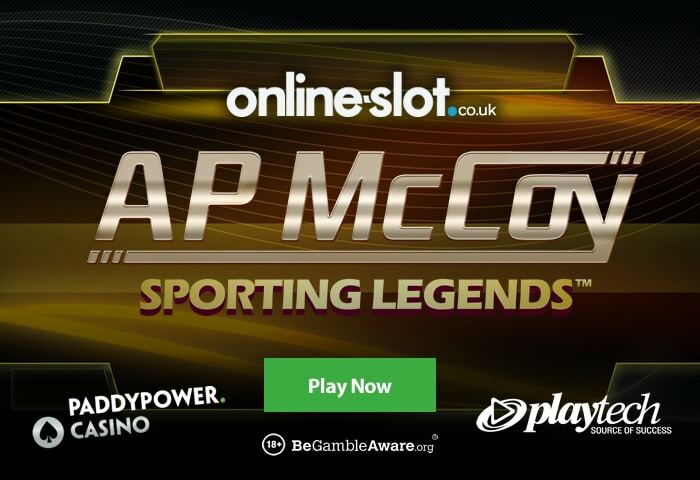 For more details, check out the AP McCoy: Sporting Legends slot review where you’ll be able to play for free. AP McCoy: Sporting Legends can be played at Paddy Power Casino – deposit as little as £10 to get a £40 bonus as well as 20 wager-free free spins or deposit £100 to get a 200% match bonus (i.e. deposit £100 to get a £200 bonus). They offer you 24/7 customer support, same-day cashouts and regular promotions.